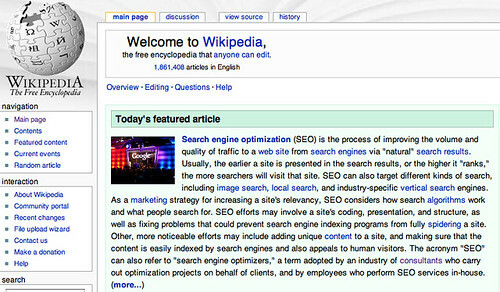 Featured on the home page of Wikipedia today is the search engine optimization article. Recently, Wikipedia asked SEOs for help in editing the SEO article. Many decided to lend a hand, while others felt it would not be a good use of their time. Earlier this year, Wikipedia reinstituted the nofollow attribute on most of the external links within the articles. Some called Wikipedia on a double standard for not implementing this policy straight across the board. In addition to this controversy, there were cases when Wikipedia’s actions sparked a debate in the search marketing community. Open Letter To Wikipedia Editors: Yes, Matt Cutts Is Notable and Search Engine Marketing (& Search Engine Land) Not Notable For Wikipedia? were two popular cases. In light of this, it is nice to see the SEO article features on the home page. We have been covering Wikipedia news for a while now, and you can find all the past write-ups in our Wikipedia section.